JERRY JONES’ BREWING war with the NFL over Roger Goodell’s contract extension has heightened tensions across the league. Jones has threatened to sue the league and some of his fellow owners over Goodell’s contract, as first reported by the New York Times. The threat prompted Jones to be removed from his position as an ad-hoc member of the NFL’s compensation committee, the committee tasked with negotiating Goodell’s contract. But that may have just been the first step. According to Pro Football Talk’s Mike Florio, some owners have discussed the possibility of going nuclear on Jones. The owners’ case against Jones would likely hinge around the recent debacle between the NFL and their relationship with Papa John’s pizza. 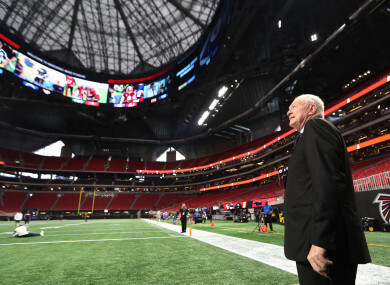 According to Florio, some owners believe that Jones made an appeal to Papa John’s CEO John Schnatter to disparage the league for a loss of revenue due to declining ratings and poor leadership during the ongoing protests from players. If that can be proven, NFL owners may be able to argue that Jones’ actions were against the interests of the league. Should the commissioner find that to be the case, and believes a monetary fine insufficient punishment, he can pass the matter along to the NFL’s Executive Committee, which has the power to compel “cancellation or forfeiture of the franchise in the League of any member club involved or implicated,” with a directive to sell the team. It’s still a long shot that other owners would make such a move against Jones. It would undoubtedly lead to years of legal cases. However, the threat of such a legal battle is at the very least another weapon being used in this blossoming war among NFL owners. Email “NFL owners have discussed a 'nuclear option' that would force Jerry Jones to sell the Cowboys”. Feedback on “NFL owners have discussed a 'nuclear option' that would force Jerry Jones to sell the Cowboys”.